Recently, the term “M2M” has begun to be heard with fair frequency among the more digitally inclined. P2P, Peer to Peer that also actually means person to person, represents communication between individual people; conversely M2M stands for Machine to Machine, indicating a connection between two objects. In other words, glasses and clothing, desks and chairs, refrigerators and vacuum cleaners, cars and traffic lights, will all one day come equipped with computing ability and a network connection that allows them to send and receive data. Consider “Bits meet Atoms” spoken about by Dr. Negroponte, founder of MIT Media Lab. The concept of combining atoms (objects) and bits (information) was first implemented in the 90s with atom→bit. This was the internet. It was when the basic stuff of reality: work, life, play, became something one could do on the internet. And in the 2000s, we can look forward to the reverse of that trend, bit→atom. Information is crossing back into the Real World. No matter where we are, the information of the internet can reach us. It has become ubiquitous. It’s 25 years since Dr. Mark Weiser, former scientist at XEROX, provided a notion “Ubiquitous Computing.” 15 years ago, as part of that model, that brought attention to wearable computers, and suggested a number of goggle-type displays, though they never caught on, even though it would have been hands-free computing. It was most likely a matter of fashion rather than a matter of the technology. Sufficiently cool wearables never materialized. But, more than that, ubiquity is about the possibilities that we see emerging from a category of infrastructure which is not dominated by fashion and design on all fronts. It is the insertion of the digital into objects such as signage, equipped as part of an outward facade, as well as municipal power supplies, made up of smart grids managed by information technology. When it comes to bringing the digital alive in objects, Japan’s qualifications as legendary are high. 8,000,000 gods are quietly inhabiting every little corner, after all. Because life dwells within all things. That is why we can accept digital pets, vending machines on street corners which greet you with “Welcome!” and turnstiles which silently open and close in response to tickets generated by “digital wallets” no matter what cellphone they originate from. 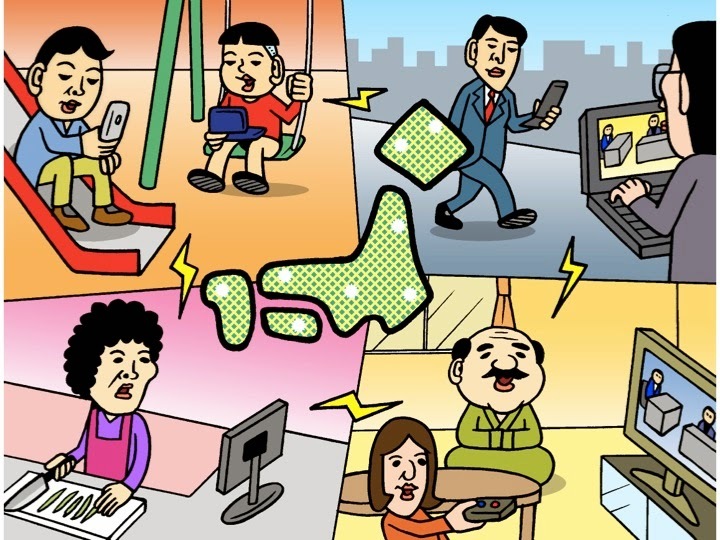 If we go by data from the Ministry of Internal Affairs and Communication, the amount of data being transmitted in Japan has increased 30 fold in the last 10 years. Estimates for the next 10 year predict a further 300-fold increase in the amount of data worldwide. The growth rate is explosive. But this is all person to person communication. If we consider the connections in machine to machine communications, assuming 100 machines for each person, that would be 100 x 100. A far greater increase in information. Things will certainly be lively from now on. Does IT have a role to play in revival?